If your company is anything like some that I’ve seen around Silicon Valley, your sales reps see their quotas increase quarter after quarter. With lofty goals, every sales rep needs to utilize all the tools he has at his disposal to close the deal. This may be obvious, but a reminder never hurts: you should always connect with your leads! Having access to the content that they like and share is paramount to having a strong conversation with them. 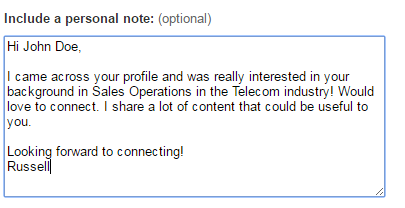 This is especially important to do if your lead is publishing original content on LinkedIn. Why? Because re-promoting their content by sharing it shows your support. Personally, I absolutely love when one of our vendors shares my content. It shows me that the rep is actually interested in having a relationship with me and that I’m not just closed won business. From the short message above, you can tell that whoever the requestor is (me, in this case), really dove into the person’s profile and even pointed out that the person had something to gain by connecting—content they might be interested in! Once you begin connecting with prospects, their activity will show up on your feed. You’ll be able to find even more prospects because of this. When your connection, say a sales ops professional, likes another sales ops professional’s content, you’ll find yourself with another lead opportunity. 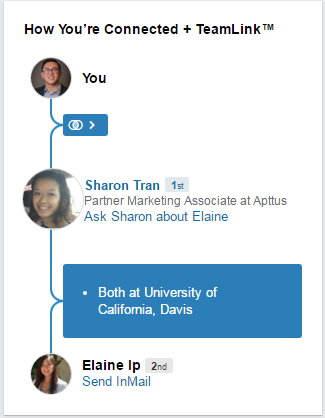 In this example, I would be the sales rep and Elaine would be the prospect I’m looking to reach. Once I see that Sharon is a joint connection, I could reach out to Sharon and ask her if she would be comfortable with giving me a warm introduction to connect with Elaine since they went to the same college. After this introduction, I can steer the ship—but this makes reaching Elaine much easier than coming in cold. If you haven’t heard of LinkedIn Sales Navigator yet, you may want to check it out. There are numerous benefits to going premium on LinkedIn, from account filters that show you your target leads at your target companies to the social selling index that measures your social selling effectiveness (which I’ll cover towards the end of this blog). Oh yeah, and did I mention you can build lead lists in your target accounts? If you already have your target persona, such as those built to segment and target audiences within your marketing automation platform, take advantage of all the filters the LinkedIn premium account offers to create targeted lists. This comes in handy when you need to, for example, find all the VPs of Sales in your region within your account tier, but don’t have a complete list of company names. 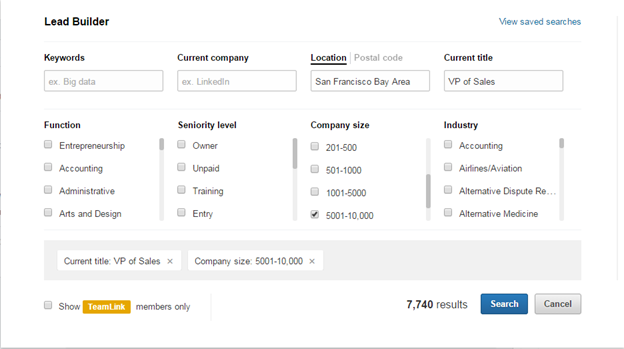 You can go even deeper with profile filters such as keywords, seniority level, and industry. If you already have a target account list, you should do some account specific profile searching by using the “current company” filter. One of the most painful things as a sales rep or business development rep is manually updating your CRM with new leads, which is equally important for your marketing automation platform since often the two platforms integrate seamlessly with the right solutions. Many times you’ll want to do prospecting in LinkedIn, but your CRM is your single source of truth (“If it’s not in the CRM, it never happened” type scenario.) 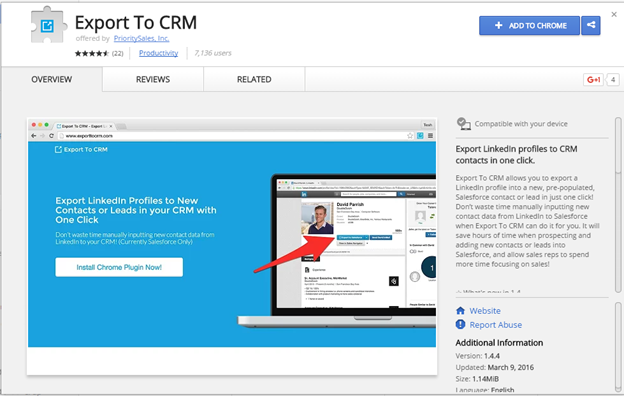 Save additional time by adding in the “Export to CRM” Chrome extension to your browser. This allows you to easily create a contact in your CRM using someone’s LinkedIn profile. This is especially helpful for the marketing team, who’s always on the lookout for new names to add to the database. Once they’re in the database, the marketing team can then support the sales team by plugging that contact into different, relevant, campaigns. Keep in mind that these contacts may not have opted-in to receiving email communications from you, so you may need to target them in other ways. If you’re someone who manages social selling, sales enablement, or social media at a company, you can easily get people excited about their SSI score with a sales performance incentive fund (SPIF) and giveaways. Doing a major team-wide competition of who can raise their SSI score to the highest in a specific month can not only help your sales team sell better, but also help you get more brand exposure. 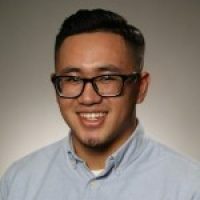 What other tips do you have to boost sales through LinkedIn or other social platforms? Share them in the comments below!